While it's still an iPhone, it's not much more than 2012's device shoved in a plastic case - although iOS 8 really helps the cause. 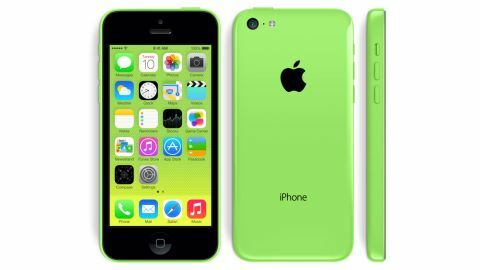 The iPhone 5C arrived to a fanfare of "affordable iPhone" headlines, but in reality it wasn't cheap enough to court the masses and Apple's 'C' series never made it to a second generation. These days the iPhone 5C isn't all that easy to come across, but with a mix of pre-owned and refurbished handsets available it still offers one of the most affordable ways to own an iPhone. Its hard-wearing, colorful plastic shell doesn't ooze the premium appeal of pretty much every other iPhone, but it's still easy to use one-handed and gives you that undeniably iPhone experience on screen. The iPhone 5C marked a new era in Apple's mobile onslaught, as the Cupertino-based firm finally broke rank from premium design and price by offering up a device which is slightly more affordable. Slightly being the key word there. Before you start getting excited about the potential of a "cheap iPhone", be warned that the iPhone 5C is no mid-range Android rival. When it was first released, back in September 2013, prices started at £469 ($549, AU$739) for the 16GB SIM-free handset. The launch of the iPhone 6 and iPhone 6 Plus has precipitated a price drop and an unexpected storage limitation. If you want a new, SIM-free iPhone 5C now, then you'll pay £319 ($450, AU$529) for the 8GB model. There's no longer an option to get it with 16GB or 32GB. In fact, through some other online retailers you can even get it for nearly half that price - but be warned, it's about to go out of stock everywhere as Apple has ceased selling the cheaper phone. So let's bust one myth right from the off then - although one that Apple never promised in the first place. The iPhone 5C is not a cheap, budget device - it's a slightly cheaper offering compared to the premium, metal clad iPhone 5S which launched alongside this polycarbonate-clad phone. Thanks to price cuts the likes of the Samsung Galaxy S5, HTC One M8, Nokia Lumia 930 and Sony Xperia Z2 are all around the same price, if not cheaper than the less feature packed iPhone 5C. One way Apple has managed to keep the cost of the 5C down slightly is ditching the glass and aluminium body seen on every handset since the iPhone 4, and welcoming back the brazen use of polycarbonate last seen on the iPhone 3GS. Now the plastic versus metal debate is one which has been raging for a few years, with Apple fans blasting the top Samsung products such as the Galaxy S5 for looking and feeling cheap - but is it time for those people to eat their hats? Pick up the iPhone 5C and there's no mistaking that this handset isn't clad in the premium materials which have adorned the more recent models, but that's not necessarily a bad thing. The polycarbonate exterior comes in a range of colourful options - green, yellow, pink, blue and white - and anyone who has owned an iPod will be well versed in these hues. This is the first time we've seen the varied palette make it to the iPhone range however, prompting some mocking from Nokia who drew comparisons between the 5C and its fluorescent Lumia range - and to be fair there is a small similarity between it and the Lumia 635 front on. The bright colours also make the iPhone 5C look a bit childish. My green review handset for example could be mistaken for a toy phone from a distance and it doesn't exactly ooze the Apple quality I'm used to seeing when unboxing an iPhone. However, look beyond that and the iPhone 5C does feel structurally sound in the hand, no doubt helped by the steel frame hidden under the polycarbonate exterior and I found I was far less concerned about it smashing. The steel frame also doubles as the 5C's antenna, meaning there's no risk of signal dropping if you fancy holding this iPhone in your left hand as opposed to your right. You won't be "holding it wrong." While the likes of the iPhone 5S and iPhone 5 are clad front and back in glass causing users to be wary at all times about the state of their smartphone, the iPhone 5C feels like it can be chucked into a bag without having to worry about its condition when it comes to pulling it back out. It's reassuring that the iPhone 5C feels like it is capable of taking a few knocks, because the slick, unibody plastic finish offers very little in the way of grip. Apple does offer a range of equally colourful rubberised skins which you can slap onto your iPhone 5C to provide some much needed additional grip, but at £20 ($29, AU$39) a pop it's yet more money leaving your wallet - plus the odd hole design of these cases won't be to everyone's taste. Of course third party accessory manufacturers offer a multitude of cases, skins and other forms of protection for your iPhone 5C, so you can find cheaper alternatives out there. At 124.4 x 59.2 x 8.97mm the iPhone 5C is slightly chunkier than the handset it's replacing, but considering the iPhone 5 was wafer thin the 5C certainly isn't overbearing in the hand and the added weight from a slightly larger battery means that it actually feels more substantial compared to the iPhone 5S. The same minimalist attitude to buttons has been implemented on the iPhone 5C, with the famous home key the only navigational aid on the front of the device, while the power/lock resides at the top and the separated volume keys on the left. Just above the volume keys is the small switch which is now synonymous with Apple's iDevice range, allowing you to quickly toggle silent/volume mode. All the keys are easy enough to reach when holding the iPhone 5C in one hand, but thanks to the elongated nature of the device since Apple bumped the screen size up from 3.5 inches to 4 you need to stretch your fingers that extra bit to reach the power/lock button. I'd much prefer this key to be located on the right hand side of the iPhone 5C, as it would make it that bit easier to access and avoids any awkward shuffling of the phone in the hand - but of course that would see Apple copying Samsung in terms of placement, and nobody wants to see any more accusations of copying coming along. There's nothing else joining the power/lock key on top of the 5C after Apple relocated the headphone jack to the bottom with the iPhone 5 - a move which isn't to everyone's taste. Joining the left aligned headphone jack on the base of the iPhone 5C is a centralised lightning port and a mono speaker to one side to help you blast your tunes at grannies on the bus or conduct a more civilised speakerphone conversation. Now the right hand side hasn't been left completely alone on the 5C, with Apple choosing this surface as the location for the SIM card tray - but unlike most smartphones that take microSIMs these days, iPhones now rock the tiny nanoSIM technology. This means you'll have to talk to your network about getting a nanoSIM for your shiny new iPhone 5C before you'll be able to use it - that is unless you're upgrading from an iPhone 5, but I'd suggest that's pretty much a waste of money. If you're coming from a similarly priced Android handset you'll probably think the iPhone 5C feels a little on the small size, with its 4-inch display more at home at the budget end of the rival OS's line up. While the screen size might not be anything special, the 1136 x 640 Retina display is present and correct on the iPhone 5C, meaning it has the same offering as both the iPhone 5 and 5S. There are even more similarities with the iPhone 5, as you'll find the same A6 processor, 8MP rear camera, 1.9 MP front camera, Wi-Fi and Bluetooth 4.0 in the 5C. The iPhone 5C is 4G enabled of course, but supports even more bands meaning it'll work on even more networks around the world. So what have we got so far then? Well, the iPhone 5C is a slightly overweight iPhone 5 with a plastic body, larger battery and a slightly lower price tag. If anything it looks to be a bit of a hard sell on paper - but with iOS 8.1 on board, there's a litany of places where it might it might excel.